With reasonable design and reliable performance, BLS600 automatic rigid box making line is an optimum choice for making first-rate rigid box. It consists of the following parts including feeder, quad stayer, gluer, spotter, and wrapper. By adopting advanced PLC system, photoelectric detecting system, precise hydraulic pneumatic deviation correcting system, convenient touch screen HMI (human machine interface with Chinese and English version) and systems and devices alike, this rigid box making line achieves high-speed production in the continuous operations below: automatic delivery of sheet wrap paper and cardboard, sticking of the four corners onto the cardboard, paper gluing, suction belt conveying, and positioning plying-up, planish, automatic collecting, wrapping and forming of cardboard box. Through the on-line operation of machinery, hydraulic, pneumatic and electric system, the cardboard box production becomes fully automatic, the traditional cardboard box producing method being innovated, and the efficiency multiplying by more than 30 times. Production produced by this rigid box making line can be used to make top-grade boxes for shoes, shirts, ornaments, gifts, and etc. 1. Feeder installed on this rig box making machine makes possible the automatic delivery for wrap paper. 2. Hot-melting glue system circulates automatically, stirring the glue and gluing wrap paper. 3. 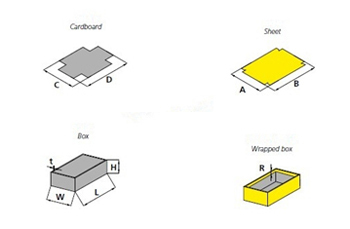 Hot-melting glue tape automatically conveys and cuts itself, and finishes the pasting of the four corners onto cardboard at one time. 4. 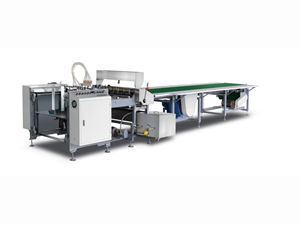 Quad stayer of this rigid box making line folds the cardboard and sticks holt-melting glue tape onto the erecting inner cardboard automatically and conveys it to corresponding place. 5. The vacuum suction system under the conveyer belt keeps the glued wrap paper from deviation. 6. The hydraulic pneumatic spotter device combined with precise photoelectric detecting system is installed on this rigid box making machine to position the glued wrap paper and fit it closely. 7. The molding section takes in cardboard box all by itself when there is one on the conveyer belt. 8. The square press tooling planishes the box that is passing under it, rendering the contact between wrap paper and cardboard neat and smooth. 9. The smart mechanical arm on this rigid box making line automatically draws boxes from the conveyer belt and delivers them to the molding section. 10. The molding section continually turns in edge sides of paper and wraps the inner cardboard box and finishes box forming process. 11. The machine adopts PLC control, photoelectric tracking system, touch screen HMI and realizes the automatic production of rigid box. 12. This rigid box making line automatically diagnoses problems and alarms them accordingly. 1. The maximum and the minimum size of the boxes are affected by the size and quality of raw materials. 2. The production speed of this machine is decided by the following factors as raw materials, glue and the operator's skill proficiency.